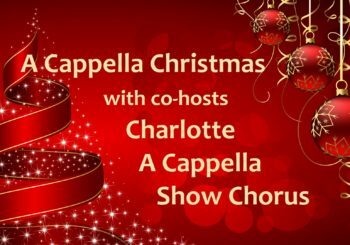 Join the Gold Standard Chorus for a Charlotte holiday tradition, A Cappella Christmas. Hear your favorite holiday songs in the unique barbershop harmony style. In addition to featuring our chapter quartets, the Gold Standard Chorus joins voices with ladies of the Queen Charlotte Chorus to perform several contemporary and classic songs. Location: St. Stephen United Methodist Church, 6800 Sardis Road, in Charlotte, just north of Charlotte Christian School.